Carbon steel investment casting is normally made through sodium silicate Lost Wax Casting process. After casting, surface treatment like painting, zinc plating, and so on needs to be done to improve the anti-corrosion performance. Taiyuan Simis has annual capability of producing 10,000 tons of different carbon steel investment cast, which are used in those industries of vehicle, electromechanical equipment, marine, and so on. Carbon steel is a steel containing carbon element less than 2.11% and no special alloy elements added. Carbon steel could be divided into low carbon steel (WC≤0.25%), middle carbon steel (WC 0.25%-0.6%) and high carbon steel (WC>0.6%) according to different carbon content. The higher carbon content is, the higher the hardness and strength will be, however the plasticity will be lower. Taiyuan Simis Precision Casting foundry could supply carbon steel investment castings weights from 0.5kg to 100kg with lost wax casting process. 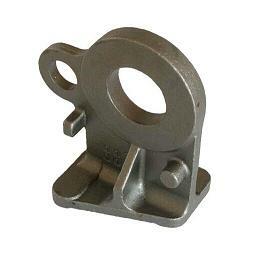 The material specifications of common Carbon Steel Investment Castings are like 20#, 30#, 45#, 80#, etc. Below are the chemical composition of common carbon steel for your reference. As a professional investment casting manufacturer, Taiyuan Simis have a good experience of producing a wide range of carbon steel investment casting products as customers’ requirements.